This recipe is easy, but you need some time for the simmering. Ginger chicken bone broth is a great base for cooking all sorts of Chinese foods and soups. It is one of the mildest and soothing drinks around. Sometimes my mom adds a few vegetables. You could also add Chinese herbs. This broth is so mild on the system that one might drink it while in labor. In hospitals today birthing moms are allowed ice (which Chinese traditional medicine followers would NEVER allow because it takes your essential energy to heat up that water) or cranberry juice or apple juice. Imagine laboring for 24 hours and having only cranberry juice! No wonder women feel like such a wreck afterwards. Something warm, soothing and more nutrient dense would be more helpful during or after such hard work. Try adding carrots, daikon, green onions, goji berries, and other Chinese herbs to make the broth even more interesting and flavorful. In a big pot put in all the ingredients, bring to a boil and simmer for 5-8 hours. Keep the lid on and the heat low and make sure to check that the liquid doesn't boil off too quickly. It is the rice wine that helps to break down the essential goodness of the chicken. Breaking up the chicken is also good. It is likely to need another hour of simmering when the meat falls off the bones and the joints easily tear apart. Strain. Salt to taste. Enjoy hot. A whole Vikon chicken is great for this broth. Or you can use chicken bones (necks and back are my favorite for their connective tissue). 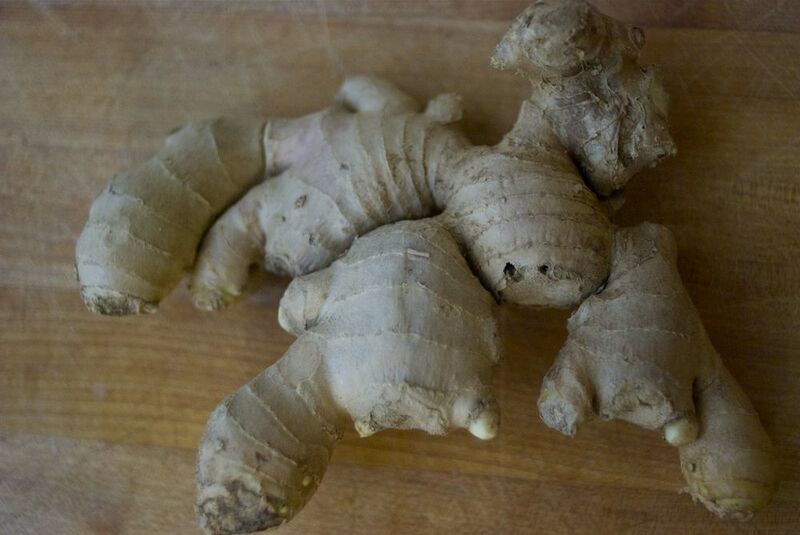 Look for ginger that is big and juicy. The ginger needs to be peeled and sliced up in disks about 1/4" thick. Use a spoon to peel ginger, and use gloves. This herb/spice can burn your hands.